The snow has melted, the courses are springing back to life, and temperatures are slowly warming up. It’s time to dust off your clubs for the first swing because it’s golf season again! But, if you’ve undergone hip replacement surgery during the winter, you may have questions about how to get back in the swing of golf safely. Here are a few tips for playing golf after hip replacement. Golfers with joint problems often undergo hip replacement surgery during the winter so they are ready to get back on the course without pain once spring comes. If you are one of those golfers, The Kennedy Center in Oshkosh has some tips, so you can golf comfortably and feel confident that you won’t injure your new hip replacement. First, because joint replacement surgery is a complex procedure, understand that time, exercise and your doctor are on your side. Listen to your surgeon and wait for their clearance on when you can get out and golf again. Orthopedic surgeons typically recommend that you wait at least 3 months before returning to low impact activities like golfing. But as every surgery and patient are different, the amount of time you’ll need before golfing again will be determined by your doctor. Exercise: Exercises are customized to you and are essential to your recovery. Take time to do them as often as recommended. Studies show that doing 10-30 minutes a day of low impact exercise like walking will help strengthen the muscles around the replacement. This will help your balance, flexibility and mobility. Make sure you get an OK from your surgeon before golfing after a hip replacement. Get ready: Hold a golf club in both hands with the club extended straight in front of you. Gently swing the club from side to side. Don’t overswing, keep it nice and easy until you know how your hips feel doing this motion. Take it easy: Try a couple of swings on the practice green before driving for the pin. See how it feels and get used to the motion. If anything feels uncomfortable or painful, stop immediately and wait another week or two before trying again. Select good equipment and weather conditions: Tools like golf carts and caddies can reduce the pressure applied to the artificial joint when walking long distances or lifting heavy weights. Good shoes without spikes can help by avoiding rotational stress. Also remember, don’t golf in wet weather – slipping and falling while swinging your club could be disastrous. You may consider slightly altering your technique as well. While pro golfers may teach you to swing with your feet flat on the ground, orthopedic surgeons often recommend any golfer with a hip replacement to play “on the toes” to reduce stress on the joint. 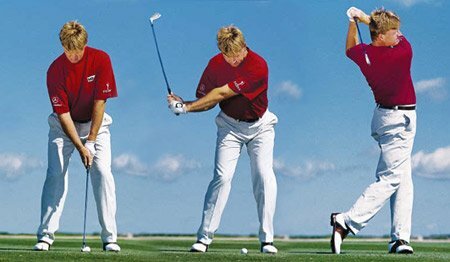 On the backswing, lift the front heel off the ground and, on the downswing, lift the back heel off the ground. The key to a safe golf game: use bigger hip turns. The last thing you want is to put stress on the hip after a total hip replacement procedure. As hip movements are triggered by the lower back, it is important to turn your trunk more to avoid stretching your hip muscles too much. Again, swinging “on the toes” will prove helpful—otherwise the stress of the trunk rotation will be transmitted to the hip. Another thing to keep in mind as you get back into the swing of things is how you bend when placing a tee or picking up a ball. It’s important to use proper technique to avoid straining or injury your hip replacement. As you bend over, put the majority of your weight on the leg without the replacement while keeping your surgical leg straight back, only using it for balance. Making this adjustment in how you bend will help you avoid a 90-degree angle with your hip replacement. Going beyond a 90-degree angle may put you at risk for dislocation. If you are looking to play golf after a hip replacement, have a discussion with your doctor at the Kennedy Center about exercises to help strengthen the muscles you use while golfing. See you on the green!